favorite items on the menu suddenly disappear. find it gone. Into thin air. Without a trace. Uncanny. your redemption on a mountain of melted cheese. you want to follow me down this path. another shameless pile of grated cheddar. Press your second slice of bread down over the whole mess. and making sure the entire beast is coated. crusty bits on the sides of your sandwich that will make it all the more delicious. want – just remember to make is a good combination of flavor and melty-ness. A terrific combination! This grilled cheese looks irresistible. Reading this version, I'm now ashamed of my version of grilled cheese sandwich, with uses only cheddar. haha! Seriously though, this is a winner. I've never thought of dipping a whole sandwich in a milk-egg mixture before. 🙂 Great recipe Joey! Hi Gio! Nice to add a melty element also and frying it up French toast style just takes it over the top…which, let's be honest, we all need some days! 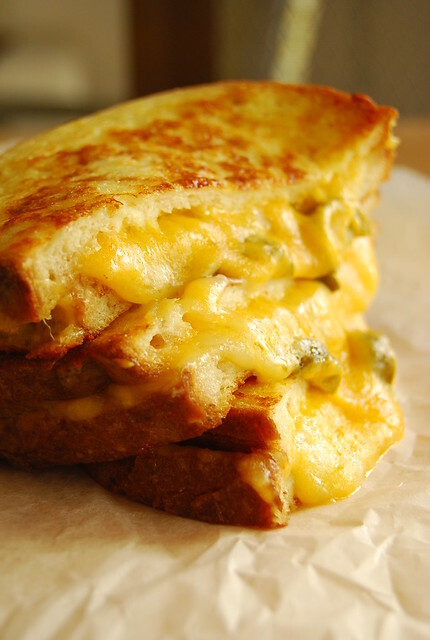 I LOOOVE cheese AND jalapenos, so I should try making this! Since I don't really cook and I'm lazy, grilled cheese sandwiches are the most common thing I make for myself at home. I just try to make different versions, for variety. I've also done French Toast versions — how could I not, when that combines two of my favorite ways to enjoy bread?! We love jalapenos. We eat way too many of them. When this entry came up on my computer, I just turned the monitor into Michael's direction and he groaned like I was rubbing his feet with warm oil. Thank you for sharing! OMG! You are such a tease! Now I am totally in need of this! I sometimes add a tomato chutney to the cheese sandwiches! Love the mix of cheeses here too! Ofcourse we could forbid restaurants to change their menu but not sure if that's the solution you're looking for.. 😉 This does look like an amazing sandwich and it's making me hungry! They say that like minds think alike? I just made my own version of B.E.L.T. over the weekend! Your sandwich + my sandwich = plenty of yummy sandwiches! Joey, this photograph looks absolutely amazing. I love how you captured the fiery cheese flavors through your post. What a great combo! I can see why you love it! Must try this soon. Thanks for sharing. Miss you! great looking sandwich! i'd experiment with other sharp and stinky cheeses as well. but that mozzy and cheddar mix looks perfectly gooey. Hi Jen! Oooh! Will check it out! Hi BettyAnn! Thanks! I do love it 🙂 Miss you too! Come visit again soon!! Hi Anonymous Paul! I'm trying some aged gruyère next! This looks so yummy! I sometimes make simple bread slices dipped in egg mixture, but never thought of frying a whole cheese sandwich this way. Thanks! I too have a jalapeno popper obsession. I like them slathered in sour cream. I am pinning this deliciousness and will immediately start contemplating the best way to add the sour cream! YUM. Hi Laura! A kindred soul! Let me know how you add the sour cream…will try that next time! This is my kind of grilled cheese! I love the jalapeño. Yum! WOW! My husband loves spicy food, and I already know this will be a big hit at home. Can't wait to try it! Hi Patty! Hope you and your husband enjoy this! I never thought of this combination, my son would love this, he is such a huge Grilled Cheese eater. Thanks for this recipe. Sounds fantastic, yummy and whatever else is in between. I am a sandwhich lover, so finding more ideas is great. And I think your writing in witty.